Hate slow internet? Well, you should. It could be shortening your life. Ericsson Consumer Lab did a sure-to-be-completely-scientifically-legit study that suggests that slow internet can literally drive you crazy. Well, not crazy, but it will drive your heart rate up. Web page loading delays led to an average of 38 percent heart rate increase. Video stream delays caused stress levels to increase by a third. It’s easy to imagine that if you were really on edge, as many people are in our fast-paced modern world, this could literally kill you. Killed by bad internet. Damn. That’s a bad look for your tombstone. The study looked at participants’ “brain activity, eye movements and pulse while completing tasks such as browsing web pages and watching video clips.” Sadly, there was no mention of what sort of video clips participants were watching, because, as anyone can tell you, some online videos are much more pulse-pounding than others. “To put (the results) in context, the stress incurred is equivalent to the anxiety of taking a maths test or watching a horror film alone, and greater than the stress experienced by standing at the edge of a virtual cliff,” the report said. At Bigpipe, we were already doing everything we could to make everyone’s internet nice and zippy, as evidenced by our multi-award-winning ads* but now our mission has even more importance. 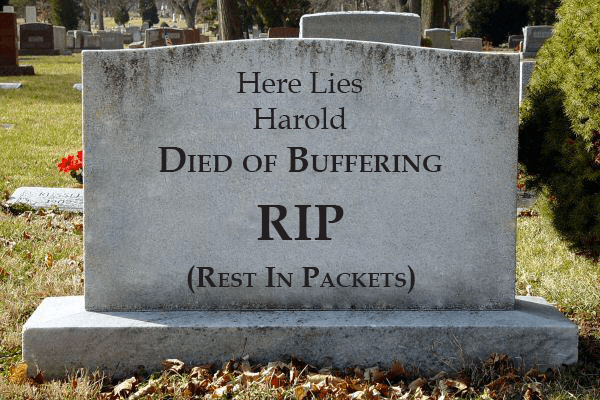 Say bye-bye to buffering today, which is a seriously big deal. Do you know what else is a big deal? Getting your first 3 months free, when you sign-up to any Bigpipe unlimited broadband plan on a 12-month contract term. *At some indeterminate point in the future. Maybe. Offer is available for new customers and ends 31 Jan 18. Includes free Bigpipe modem and connection (worth $148). Ts & Cs apply.